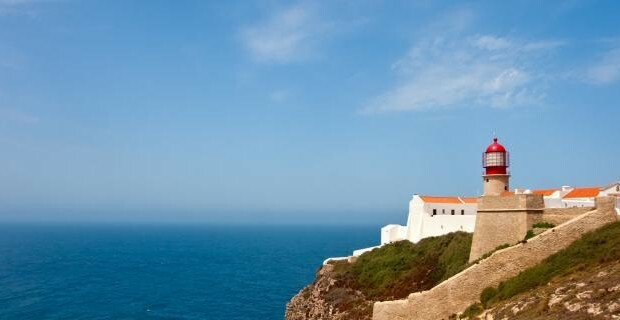 The coast of Portugal from Zambujeira do Mar to the southwest tip of Europe at Cape Sao Vicente makes for a delightful self-guided 8 day walking tour. Hike between villages along cliff tops, between sand dunes and beside rocky shorelines. Visit the natural park of Sudoeste Alentejano e Costa Vicentina. Stop to enjoy the local food and wine along the way. After checking in to your hotel, spend some time exploring this charming village, which is set against a backdrop of wild beaches and rugged cliffs. In the evening, sample fresh caught seafood in one of the family owned restaurants in the village. A taxi will take you to the village of Almograve. From there, you will walk along a coastal section of the famous Rota Vicentina, the historic footpath used by Portuguese fisherman for centuries. Passing Cavalheiro and the lighthouse at Cape Sardao, you will be rewarded with spectacular views. This 13 mile walk takes about seven hours. 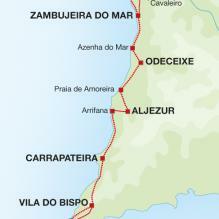 This walk follows another section of the Rota Vicentina through rolling dunes and along rocky shores where storks nest. You will pass several beaches and the fishing village of Azenha do Mar before reaching the rural village of Odeceixe, where you will spend the night. The 12 mile long walk takes about 6 hours. Today’s route gives you a choice. The Rota Vicentina goes inland through farmer’s fields and a landscape of heather and fragrant shrubs. If you’d prefer to remain on the coast, an alternative route crosses ravines from one beach to the next, but is only available at low tide. Whichever route you choose, a taxi will meet you at the end of your walk and take you to your hotel in Vale de Telha. Here, you will find a swimming pool and an excellent restaurant. This walk takes about 7 hours for the longer inland route and 4.5 hours for the shore route. Once again, you will have a choice of routes today, depending on the tide. After a short taxi ride to the fishing village of Arrifana, you can walk along rocky strands and sandy beaches if the tide is out. If the tide is high, an alternate route takes you inland via Bordeira to Carrapateira, where you will find your hotel for the night. The coastal route is 7 miles long and takes about 4 hours. The inland route is 14 miles long and needs 7 hours to complete. The tide will determine your route again today. Choose between an inland and a coastal section. Either way, you are likely to spot fishermen perched high on the cliffs. Your route ends in historic Vila do Bispo, where you will spend the next two nights in a hospitable hotel, complete with indoor swimming pool and sauna. You can expect today’s 12 mile walk to take about seven hours. Your last day of hiking takes you through pastures and fields to the far southwest corner of Portugal, walking along flat tracks and narrow fishermen’s paths above rocky shores. If the weather is warm, you have the option of stopping for a swim at Praia do Ponto Ruiva, a favorite place for those European surfers lucky enough to find it. Your walk ends at windy Cape Sao Vicente, with sweeping views of the ocean. From here, you can either walk back to your hotel or take a public bus back to Vila do Bispo. The 8 mile walk to Cape Sao Vicente takes about 4.5 hours. Add 1.5 hours if you plan to walk back to town. Spend the morning in historic Vila do Bispo having breakfast and do some last minute shopping before heading to your next destination. A water bottle, sunhat and sunscreen are essential. Walking poles and a flashlight with new batteries are recommended. Bring well worn, sturdy walking boots with good ankle support. Sandals and/or trainers are recommended for relaxing in the evenings. A light raincoat may be needed at any time of year. A warm jacket is recommended for cooler evenings and nights early and late in the season.